As one of the major automotive manufacturers of the National Association of Home Builders (NAHB), we’re pleased to extend this private offer up to $250/$500/$1000* toward the purchase or lease of most new GM vehicles to association members. 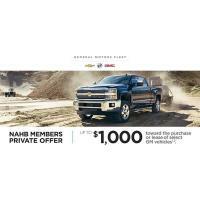 Just visit your local Chevrolet, Buick or GMC dealer, choose an eligible vehicle and present your NAHB Proof of Membership form. Then stack this offer with additional current incentives from the National Fleet Purchase Program** and Business Choice***, and Fleet Cash****.